Home » Top 10 places to visit on your Poitou Charentes holiday! Top 10 places to visit on your Poitou Charentes holiday! Poitou Charentes is a great choice of destination for holidays at any time of year! 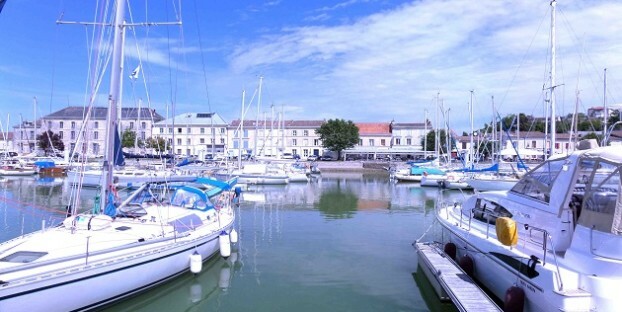 The mild, sunny climate and stunning beaches of the Atlantic Coast are within easy reach at around four hours drive from The Channel ports, and whether you want beautiful countryside, fascinating history, bustling seaside resorts, world-class attractions or fantastic French cuisine; Poitou Charentes has it all! This lovely port city is a firm favourite with it’s pretty harbour, quaint streets of shops, pavement cafes, markets and the amazing aquarium right on the waterfront. La Rochelle Aquarium is rated as one of the best in Europe and includes a stunning array of sea creatures and interactive displays to experience. It can get busy so it’s best to buy tickets in advance to beat the queues, it’s worth noting that opening hours extend well into the evening in the summer and that can be a quieter time to visit. The bustling restaurants on the port can be expensive but delve a little deeper into the surrounding side streets and you’ll find some wonderful places to eat. There are also street food stalls and ice-cream parlours; take the children for a fun evening out eating sticky crepes and watching quirky street entertainers – from performing mice to gravity-defying human statues you never know what you’ll see next! The Futuroscope theme park in Poitiers is famous for its science-based entertainment and a must for families holidaying in the area. From exciting rides to educational interactive displays and spectacular shows a day will barely be enough to enjoy all this attraction has to offer! Even if you’ve visited before it’s well worth a repeat trip with new attractions added each year – don’t miss The Extraordinary Journey, Drone academy and the illusion magic show, all new for 2017. A unique wetland area, the Marais Poitevin Natural Park is known as the ‘Green Venice’ of France. Explore the nature, wildlife and breathtaking landscapes hiking, cycling or canoeing the mapped routes, or take a guided tour by flat-bottomed boat or horse-drawn carriage. There are four discovery centres dotted across the site where you can find out more about the wildlife and history of the area. Everyone has heard of this town thanks to the famous brandy produced here! Take a factory tour to see the alchemy in action and taste the impressive results – with big names like Hennessy, Remy Martin and Martell all based here you’ll be spoilt for choice. As well as Cognac you must try the local aperitif Pineau des Charentes; this delicious fortified wine is made with Cognac eau-de-vie and tastes like nectar! Definitely one to stock up on and bring home. If you want a classic seaside resort Royan is your answer! With plenty of beaches to choose from, there is something for everyone! Grande Conche and Foncillon are sheltered and sandy with all the seaside facilities; ideal for families with young children. Those in search of peace and tranquillity should head for Pigionnier or Chay beach, and Pontaillac beach is where you’ll find the best surf. As well as its wonderful beaches, Royan is home to the highly recommended Palmyre Zoo and the beautiful Jardins du Monde where you can stroll through gardens of the world and explore the magical butterfly house. If you’re interested in history then the Roman sites at Saintes will definitely be on your list of places to visit. Saintes was the capital of Aquitaine in Roman times and you can understand the significance of the place when you see the remains of the incredible amphitheatre here that once accommodated 20,000 spectators, and marvel at the size of the impressive Roman triumphal arch of Germanicus that dates back to 18AD. This exclusive island off the coast near La Rochelle is reached by a toll bridge. The island itself is beautiful and peaceful; bicycles are the most common mode of transport and a great way to explore the island. The beaches are unspoilt and uncrowded, great for rock pooling, sandcastles and paddling in the sea. The main town on the island is St Martin which has a charming quay lined with restaurants and shops. As you would expect, seafood is a speciality – try the local oysters; the island’s oyster farms produce up to 8,000 tons of them every year! This wonderful animal park gives visitors the chance to see monkeys in an environment as close as possible to their natural habitat. Vallee des Singes uses islands instead of cages so the primates live in semi-liberty with visitors able to observe, and sometimes even walk amongst them as you explore the park. It’s a magical experience to see and hear the lemurs and marmosets in the trees around you – just watch out for the cheeky ones who will pick your pockets if you’re not careful! The medieval town of Chauvigny boasts not one, not two but five castles! The most impressive is probably Donjon de Gouzon which dates from the 11th century and offers panoramic views over the Vienne river valley. You should also visit the ruins of the Baronnial Chateau for the impressive birds of prey show that takes place daily during the summer months. Poitou Charentes Atlantic Coast has long been a destination for wellbeing and therapeutic treatments designed to relax your mind and body. There are six Thalassotherapy centres along the coastline including one at La Roche-Posay, home to the world-famous skincare range. Book in for relaxing spa treatments using spa waters and sea minerals to refresh, rejuvenate and invigorate – the perfect holiday treat!